Mierop Design is complete landscape and exterior design resource offering a wide range of services from consultation through design, installation, outdoor furnishings and property maintenance. Since 1998, Mierop Design has become known throughout the area for tasteful and distinctive designs noted for their uncontrived and natural expression, attention to detail and quality craftsmanship. 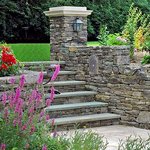 A beautiful landscape is an enduring investment in the enjoyment and value of your home. Expert space planning plus a distinctive palette of color and plants enhance any property immensely. A favorite among real estate agents, a Mierop landscape is often highlighted as a selling point in property listings. After winning the Grand Prize Golden Trowel Award from ‘Garden Design Magazine’ in 1995, Lisa Mierop began with a few commissions that led to the opening of Mierop Design in 1998. In 2003, the demand for her work led to opening a design studio on Walnut Street in downtown Montclair. Here clients can peruse portfolios of work, access a library of references and view samples of outdoor furnishings, garden ornaments and accessories for today’s outdoor living. 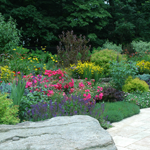 Lisa holds a double certification from The New York Botanical Garden (NYBG) as well as Professional Certification from The Association of Professional Landscape Designers (APLD). She has taught classes for The New York Botanical Garden, The Montclair Garden Club, and for Van Vleck House & Gardens which has also featured her as a Key Note Speaker for their ‘Roses to Rock Gardens’ tour. Many of her projects have been highlighted on this favorite local garden event. An active member of the Houzz on-line design community, Lisa was recently honored with the 2018 Best of Service award, her third consecutive for this prestigious recognition received by only 5% of Houzz professionals. Additionally, Mierop Design’s photos have been saved over 10,000 this year to viewer Idea Books and Albums. In addition to design and installation services, Mierop Design is unique in offering: Pavillion Outdoor Furnishings, an outdoor decorating service to guide you through the layout, design and purchase of outdoor furnishings and ornaments, and The Landscape Guild a customized maintenance service to keep your new garden looking its best in every season. 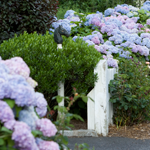 You can follow Mierop Design through Lisa’s monthly gardening blog, The Suburban Lot, covering topics of interest to clients, homeowners and garden enthusiasts. After a lifetime in Manhattan apartments, I moved to Montclair in 1987. I arrived with a lot of available time, no family responsibilities and no driver’s license, which made adjusting to suburban life rather awkward. For New Yorkers, creating a home is something done behind doors and windows, but life in this community had other plans for me. Desperately seeking something to do, I decided to try gardening, and one weekend for the first time, I planted a bed of flowers. I spent the rest of the season watching those flowers grow, consumed by their care and beauty. I was a ready convert. When my new kitchen was renovated soon afterwards, a picture window was installed over the sink that framed a view of the backyard. Unfortunately it was a sorely neglected sight, full of weeds and so shady I wasn’t sure what would grow. But with my new interest in gardening and a beginner’s naive enthusiasm I was determined to improve the view. A few years and many tons of moss rocks and topsoil later, my backyard became a place of calm and color, lush with flowering shrubs and romantic shady walkways. With the completion of my own garden, I entered an amateur design competition sponsored by Garden Design Magazine. Months later, the surprising word came: I’d won the Grand Prize Golden Trowel Award. Photos of my garden were published along with my story in 1995. The following months brought a flurry of additional write-ups in publications and I started getting small commissions for my work. My business was born. Over the next years I grew from designing small perennials gardens to taking on full architectural projects. I opened my own full service landscape design/build firm in 1998 and by 2003, I added a design studio in the Walnut Street Business District, one of Montclair’s quickly gentrifying destinations. At the studio, clients can relax while they review portfolios; examine proposals, product samples and even shop for furniture, lighting and garden ornaments – all in a comfortable, home-like atmosphere. Fortunately, when it comes to the business of making gardens, I am not alone in my passion. The emphasis placed on outdoor living has boomed in the last decades. Gardens have become an integral element of gracious living, as much a part of coming home as a comfortable sofa or a beautiful new kitchen. I always tell my clients that the garden is their biggest room, and the creation of a lovely home can never be complete until a beautiful landscape surrounds it. I thank you for your interest in Mierop Design and look forward to helping you transform your property and realize your landscape dreams.